Die Einführung einer neuen Version von Sim City hat der Spiele-Hersteller EA verpatzt - auch deswegen wurde er vom Verbraucherportal "Consumerist" zum schlimmsten US-Unternehmen gewählt. Geschäftsführer Peter Moore will das nicht auf sich sitzen lassen und provoziert einen Streit über den "Golden Poo Award". "There was hope that the video game giant would get the message: Stop treating your customers like human piggy banks, and don't put out so many incomplete and/or broken games with the intent of getting your customers to pay extra for what they should have received in the first place." "This is the same poll that last year judged us as worse than companies responsible for the biggest oil spill in history, the mortgage crisis, and bank bailouts that cost millions of taxpayer dollars." 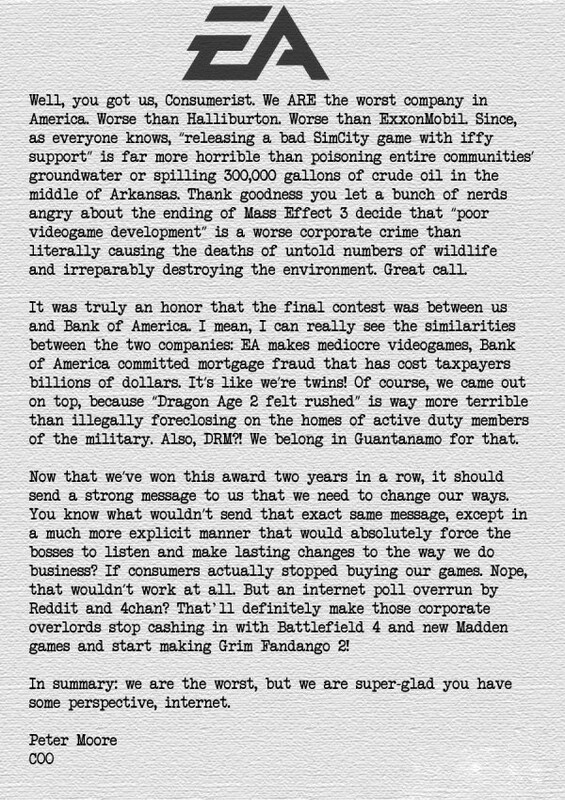 "Since, as everyone knows, 'releasing a bad SimCity game with iffy support' is far more horrible than poisoning entire communities´groundwater or spilling 300,000 gallons of crude oil in the middle of Arkansas."